I wish to confess straight up to having duel motives in reading The Joy of Relationship Homeschooling . I ran across Amy's review and was intrigued by the sound of it. I read her review on a day that was a. day. if you know what I mean. This book sounded like it could have some answers for questions and some encouragement for weariness. I was into my reading of Desperate (linked to review) at the time but that wasn't quite hitting the spot so I thought I'd try this one by Karen Campbell. Karen Campbell......boy did that name start ringing some very loud bells! I knew that I knew that name. Amy linked over to Campbell's blog, That Mom, and I hastily clicked over and began to scroll through her posts in an effort to confirm that she was who I thought she was. Yup. She was! And I laughed. (I have to confess that part too.) I went to school with one of her sons. 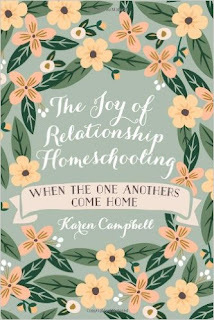 Any of my fellow students reading this review will likely understand my enormous curiosity to read a book written by Karen Campbell about homeschooling and parenting. The want-to instantaneously changed into a had-to. Let me be quick to say that the "had to" comes as a result of her son having a rather memorable personality (heh heh heh) and because I know him to have a solid head on his shoulders, a fantastic family, and a faith which has at times ministered to me deeply. But I'll tell you more about that in a minute. First, I ordered the book. Then I read it. Then I spent several days trying to figure out what I was going to say about it. Wish me luck, guys. Wish me luck. I really hate talking about it. My position is that every age in history has had some heretical teaching which has risen up and distracted God's elect from following after Him. I believe ATI is one of these organizations where one man presented himself as God's prophet (more or less, but pretty much more) and convinced well-meaning Christians that they needed to obey his every directive. Gothard's message as to what the Gospel of Jesus Christ is was simply screwy. Whenever you follow false teachers and bad doctrine you're guaranteed to make some pretty bad decisions and choices with your life and in your family. Bad decisions and bad doctrine have and always will have horrific consequences and this is why scriptures teach us to be wary of wolves in sheep clothing. We must always set all the teaching from man up against the Word of God and judge it. (Yes. I said "judge" and my big and bad, mean-y self actually meant "judge.") If a teacher or teaching is found wanting, discard it. Walk away from them. Avoid anything which draws you away from the Gospel of Jesus Christ. This is true for all ages, all seasons, all generations, and all believers in all centuries until the second coming of Christ. Until He comes again, there will be hoards of false teachers claiming to know truth when they are doing nothing but tying millstones around their own necks. Beware. Be on guard. If you fall prey, turn away as soon as you realize the truth. Be grateful to know truth. Be thankful for salvation. Be enthralled with grace. Be repentant. Be forgiven. Be set free. Then? Move on. With gratefulness. I know ATI is a hot topic but the fall out from those "recovering grace" seems to be more painful than it has to be. I do realize that grace now needs to be rightly understood by those who followed Gothard, but at the same time it doesn't seem to be acknowledged that grace was there all along. Yes, Gothard's teachings did do damage. As expected. As is always the case. But the Victor in it all is still Christ. Always Christ. He cannot lose and nothing that anyone has been through is wasted in the eyes of the Redeemer. So my sympathies towards beating the dead Gothard horse (because I do think its rather dead now...) are at a low ebb. Hating Gothard was definitely the thing to be doing in 2014, at the time when Mrs. Campbell's book came out, so I understand the frequent interjections. But it still rankled and it dates the book in the sense that Gothard is trapped in the list of false teachers in the 1980's and 90's. Do be aware of him because someone else will rise up to take his place. But let's not fixate on him to the point of distraction towards the future or the ultimate Victor. If I were to be more succinct: stay vigilant but keep. moving. along. Whether you were or were not in Gothard's "cult" you could have been wounded by false teaching some place else. I wasn't in ATI but I have scars of different natures. I don't feel like hashing and re-hashing them because my problems are but "light, momentary afflictions" and I believe they are useful in making more more like Christ. I see Gothard in the same light. In the hands of the Redeemer, nothing is wasted. The main argument that Mrs. Campbell hopes to make with her book is that parents should practice "one another-ing" their kids, using the Sermon on the Mount as her main argument. She goes about making the case that just because our children are our children doesn't mean that we aren't required to treat them with the same love and respect that we give to our fellow adults. Children are valuable and are given to us to raise, yes, but that we need to keep in mind that they are also our brothers and sisters in Christ. This is the crux of her message. Although I may not have always agreed with the way she suggests "one anothering" your kids, I do agree with her in general. I do wholeheartedly agree that my children are my brothers and sisters in Christ. They are future adults and, I hope, future friends of mine. But at the present moment, they are also still children who need to be trained up. I think perhaps Mrs. Campbell and I disagree on training methods but, then again, I could be wrong about that! I do understand (and agree!) that ultimately my children belong to God and not to me. My job is to teach them of this and remind them of this as they grow. My job is not to tell them what I want them to do from now and for all time. At one point during the memorial service, attendees were asked if they would like to stand up and share something with our family. Various persons stood up and spoke some sweet nothings, all of which I've forgotten. Towards the end of the sharing time though, Karen Campbell's son stood up and addressed the family. He was the only one in the entire room who had an open Bible in his hand as he spoke. I remember thinking this. I remember that he spoke from the Psalms and he offered true words of life and hope and peace. Which passage he read I can't exactly remember but I'll tell you this: the fact that he stood up and addressed us with scripture was deeply impacting and meaningful and provided an anchor for my soul which was being tossed about by severely troubled waters. The scriptures being delivered to me were the only things that matter in that moment. All the well wishers in the world truly don't mean a thing without Christ as the cornerstone. I thought on this event throughout the second half of reading The Joy of Relationship Homeschooling and despite whatever else I might say or not say about the book itself, I can, without a doubt, confirm that Mr. and Mrs. Campbell have striven to apply themselves to the Word of God on the matter of raising and homeschooling their six children. The proof is in what I have witnessed of their son and, that said, I have a great deal of respect for Mrs. and Mr. Campbell both. I would be a fool not to have this respect. One another-ing one's own kids is really hard to do. Especially when you are around them 24/7 and in several roles (some of which many families choose to assign to other people). A homeschooling mom is always "on" and seldom off. I appreciated this book because it reminded me to cut myself some slack, give myself a break now and then (without guilt! ), and to press into scripture and prayer to do this most important work. Sometimes you just need a pat on the back and a good laugh to get you going again and I felt very much like that was what Mrs. Campbell offered. For that I am grateful. Now, if you made it through this review then I owe you a pat on the back. I ordered this book off of Amazon which, as you can see, is a little pricey. I could turn around and resell it but truly I'd rather pass it along to another homeschooling mom who might be feeling a bit parched. If that's you, and you think you could glean from this book, then leave a comment below and I'll mail it off to the first person who speaks up for it. This book might not exactly scratch your whole back, but it could help with the itch. If you think it might then please do allow me to send it your direction. I am interested & homeschool- thanks Carrie! Sarah, I'll send it to you. I'll send you an e-mail and get your address. And, rereading my comment, I realize that what I've said probably makes no sense, but I'm going to leave it anyway. Because. Good thing I can read it for free on my Kindle. Now to squeeze out the time. . . I'm totally curious now, what is 'one othering'? I've never heard of it. @Erin - Treating your children as you would like to be treated. I think Campbell would err more on the side of giving her children adult privileges (she cites an example of giving one of her sons a piece of cake that was reserved for adults at a particular function). I can appreciate her heart in it, but I don't allow my kids to think that they have ALL of the rights an adult has to anything that they like. Wisdom comes with age and there's also a need to respect the requests of adults (both their parents and others). I'm all for "one another-ing" with some wisdom and discernment attached. And sometimes that means that when a cake is reserved for adult company, the kid doesn't get to eat it. Thanks for explaining, I'd never heard of this word.